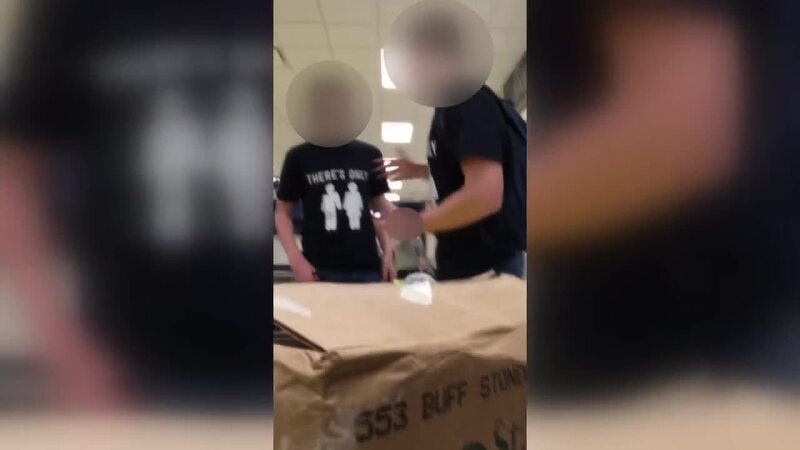 Some students at New Berlin West High School wore homophobic T-shirts Monday in the cafeteria, and the video was shared on social media. NEW BERLIN, Wis. — Some students at New Berlin West High School in Wisconsin wore homophobic T-shirts Monday in the cafeteria and used inappropriate language, and the video was shared on social media. Michael Fesenmaier, the school principal, and Joe Garza, the superintendent, acknowledged the video Monday and Tuesday. A student in the video can also be heard using a homophobic slur. This afternoon, we were made aware of a video taken at New Berlin West after school. It appears the video was made today and is already making the rounds on social media. The language used in the video by the students will not be tolerated in our school. We do not believe the views shared in the video are reflective of our student body as a whole. We are currently investigating the situation. And while we cannot share any specifics regarding student discipline, please know that we intend to hold the students involved accountable with appropriate consequences. The language used in the video is not appropriate and will not be condoned in our schools. New Berlin West administrators are investigating the situation, and all those involved will be subject to appropriate disciplinary actions. That said, we do not share student discipline details with the media.